Nigel Farage, leader of UKIP. 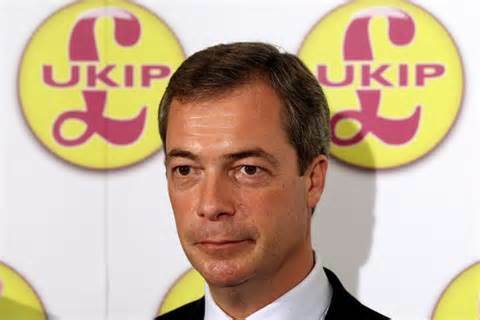 According to Sky News today, UKIP (UK Independent Party) has made considerable gains in the local elections. It is now the second biggest part in Lincolnshire, reduced the Conservative grip in Essex and Hampshire, and finished second behind Labour in the South Shields. UKIP presents itself as a non racist party. On their website http://www.ukip.org/page/ukip-manifesto they focus on two popular policies among the British people, leaving the European Union and putting a stop to mass immigration. Both subject matters when discussed openly, honestly and sensibly are actually important to people who live in Britain, and that includes Black and minority ethnic populations who have been contributing to the British economy and pay their taxes since their arrival. Yet there remains a fundamental racist hypocrisy with political parties when discussing immigration, and that is their refusal to accept the fact that most mass immigration to Britain is based on corrupt British foreign policy overseas, where often the British military are pursuing conflicts in the countries of the immigrants for resources or economic gain. If you read my 2010 article mentioned above, I go into detail about the British government’s wicked arms campaign sustaining and fuelling conflicts all around the world. So is it any wonder that people from these war-torn countries seek haven in places like the UK? Would you want to raise your children in a war-torn country? The answer is obvious, but the political parties never mention facts such as these because it would render their immigration scare tactics during elections ineffective. It is these deliberate lies and falsehoods which leads to a racist mentality among British people and therefore the immigration debate in Britain, whether it is discussed by the Conservatives, Labour, Lib Dems or UKIP continues to be a lying, racist ideology which serves to keep the majority of the British population naive. A glance at UKIP’s website, specifically their manifesto does not mention any role Britain has had to play to why immigrants come to the UK. Check the British National Party’s website and there is the same deliberate silence. Check, Labour, Conservative or the Lib Dems website and you will come across the same deliberate misleading ideology, that immigration is merely something that just occurs without a root to the trend. From the founding of this website I have been calling for a sensible, honest debate about immigration and to this date not one debate has dealt with the issues in this article. For these reasons the immigration debate in this country remains racist, in the sense that whilst people are being told to go back to their country of origin or stay in their country of origin, the British government continues to pillage their natural resources and fuel conflicts in these countries. There is a definition for this kind of hypocrisy, it is called racism. This entry was posted in National News and tagged Nigel Farage the co-founder and leader of Ukip, UKIP a party which claims to be non racist, mass immigration to Britain. Bookmark the permalink. 1. Do you have a link for the alleged quote made by Nigel Farage? 2. In terms of timing: did you intend for the post to coincide with the local elections? Yes, the link for the quote attributed to Mr Farage can be read in this article, http://www.guardian.co.uk/politics/2005/feb/06/otherparties.politicalcolumnists second paragraph. In regards to timing, I thought it was pertinent to discuss the political ambitions of UKIP as immigration is one of their big attractions for British voters, and of course their new find political success makes it even more important for black and minority ethnic communities to be aware of these so called nationalist political parties, UKIP being one of them. Thanks for pointing out the relevant paragraph. It’s ‘out there’ for sure; I wonder why it didn’t get much media traction? Timing-wise, I couldn’t agree more – it’s a pertinent issue. Sunshine, as the saying goes — is the best form of disinfectant. I just thought posting the article prior to the election may have garnered more attention – which it deserves. Nevertheless, the debate continues… Keep on the good fight. I completely agree. The thing is I have written substantially about immigration on this website and I feel sometimes that I do not want to go over things that has already been said, hence why I never wrote the article in the run up to the election; however with UKIP gaining the media attention with their political gains I thought that a short piece reminding readers how deceptively political parties such as UKIP use the immigration debate was needed. I do take your views on board and thank you for your support, it is much appreciated. Thanks for providing links to the racist quote the UKIP leader had made. Sadly racism is spreading across Britain, because the number of white people who are finding secret comfort in voting for the UKIP; does so as they see this as not being as bad or even being on the same par as voting the BNP… but a lesser evil. But behind their vote is nothing more than white people craving a white England, or something less ethnic; a raptured Jerusalem fit for Blake, music sweet enough for Elgar’s moving piece of: ‘Land of hope and glory’ where the English beers are plenty and the Church bells rings on due time, English children play only with white children and where non-white sailed back to where they came from. This is the dream of (most) white people.